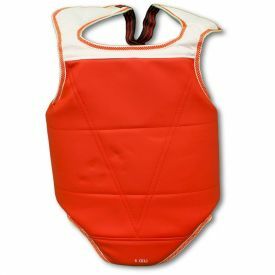 Designed by Christine Bannon-Rodrigues, 9 time martial arts world champion, this ultra-light-weight chest protector allows excellent mobility. 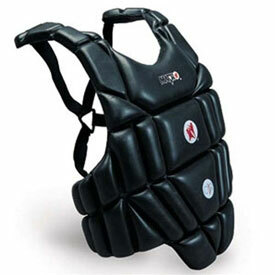 Shock resistance and protection is provided by 1 inch thick high density thermo-formed polyethylene (HDPE). 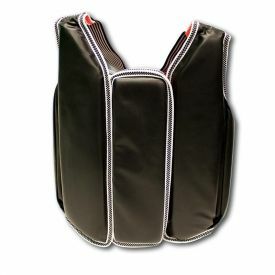 The "above the hip design" minimizes movement of the chest guard when holding chamber position. This is a solid, high quality piece of equipment. 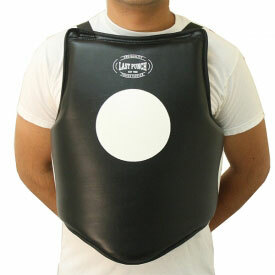 The width of the chest guard is measured flat from left to right. The ends of the chest guard should cover your sides, leaving the back open. The straps area adjustable in the back.